Shallot and Onion Sets are So Easy to Grow Few things in life are easier than growing Shallot and Onion Sets. Prepare their bed in a nice spot with well-draining, neutral pH soil with a minimum of six hours of daily sunlight. Incorporate neutral pH compost, well-rotted manure or a well-balanced fertilizer as necessary. Separate multiple bulbs and plant each individual bulb, root end down, 1" deep and 4" to 6" apart in rows spaced 18" apart. Once planted, bulb tips should be level with the soil surface. Do not mulch because the dark green shoots that appear within a couple of weeks of planting are not strong enough to push through mulch and may rot. After planting and over the course of the season, water at the rate of about 1" of water per week if rainfall is sparse and the soil becomes dry (lighter in heavy soil). Easy to grow, Shallots and Onions love water and food. Weed the bed regularly and remove any seed stalks so that the plant's energy focuses on bulb formation. Stop watering once the tops begin to brown and dry out, and the bulbs have reached maturity. Once harvested, dry and cure Shallots (for one month) and Onions (for two to three weeks) in a warm spot out of direct sunlight with good air circulation. Do not dry and cure them outside or in the sun where they can get sunburned and rot. Once cured, both Shallots and Onions should be stored in mesh bags in a cool dry area for up to eight months at an optimum storage temperature of 35° to 45°F. Our Onion Sets are small bulbs up to 1" in diameter for planting as soon as the ground can be worked in the spring. 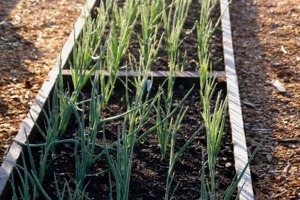 Or, you may plant them 2" apart so that you can harvest every other plant as slender green onions (scallions) in four to six weeks: they intensify in flavor as they mature and grow larger. 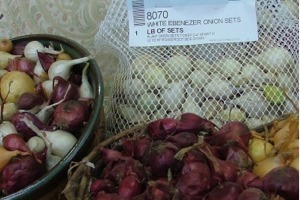 The remaining bulbs take another six to nine weeks to grow into mature storage Onions, depending on the season.